Macro photography has traditionally involved either extending the lens from the camera body using bellows or extension tubes, or else mounting an auxiliary close-up lens to the front of the camera lens. These techniques produce either light loss (in the case of bellows or tubes) or optical degradation (in the case of auxiliary lenses). Light loss is induced by extending the lens (the so-called bellows effect). This requires compensation of an additional 2 stops of light for every doubling of the lens-to-film plane distance. Moreover, bellows or extension tubes are bulky, especially for use in the field. In addition, bellows units tend to be costly, especially for medium format cameras, and are generally unsuitable for use with zoom lenses. Many of todays digital and video cameras have fixed, non-interchangeable lenses, typically of the zoom variety. With these cameras, the only macro option available may be an auxiliary close-up lens. However, auxiliary lenses tend to degrade optical performance, by reducing contrast and sharpness or adding distortion. The Zörk Makroscope solves the problems associated with bellows extension and auxiliary lenses. The Makroscope is a 12 diopter, high resolution close-up lens with two critically corrected aspherical elements and state-of-the-art multi-coating. Its imaging performance exceeds that of most high-quality standard lenses. It has a rear thread of 52 mm by .075 for direct attachment to many standard SLR lenses. The Makroscope can also be used with many zoom and most macro lenses to extend the close-focusing range, with no loss of optical performance. Since the Makroscope fits on the front of the cameras lens, all normal functions remain intact, including auto-focus, full aperture viewing, and multi-mode metering. The Makroscope produces approximately a life-size image, without light loss, on most standard, short telephoto, and zoom lenses (maximum focal length should not exceed 135mm). 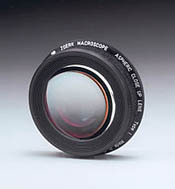 On a lens of 80 mm (a short telephoto for 35mm or normal for medium format) the Makroscope produces a 1:1 image with a working distance of approximately 2.5-3.5 inches (this will vary according to the front barrel design of the lens to which it is attached and the type of adapter ring that is used). The Makroscope is part of the Zörk modular system and is designed to work with the Multi Focus System (MFS) to take advantage of the increase in effective depth-of-field provided by tilt and swing movements (the Scheimpflug effect). It will also work with MFS in combination with the Panorama Shift Adapter or Pro Shift Adapter. The Makroscope also works with Zörk Pinholes. For nature photography, in particular, maximum depth-of-field and efficient use of available light is crucial. In this application, the Makroscope, used in conjunction with the MFS and/or with the Pinhole system optimizes performance in the field. It does so without requiring the added bulk of artificial lighting to compensate for the bellows factor or to provide adequate depth-of-field. Used in conjunction with the zoom lens on a video or digital camera, the Makroscope will provide a working distance of around 3 and can provide intriguing zoom journeys into extreme close-ups of the subject. 1. The Makroscope is fully compatible with the Zörk MFS and short mount lenses (such as APO Rodagon), and permits a full range of tilt/swing movements. 2. With some applications, the protrusion of the front element of the camera lens may require a spacer in order to avoid contact with the rear element of the Makroscope, which could damage either or both lenses. Please see supplemental table for additional information on magnification, working distance, and extension light loss of Makroscope on the Multi Focus System. The Makroscope may be used, with the appropriate adapter and/or spacer ring, on a wide variety of cameras and lenses, including point and shoot, DSLR and mirrorless system lenses, video cameras, and medium format lenses. Zörk can supply a mounting ring for your lens / camera. Please contact us with specific model and lens type for availability information.